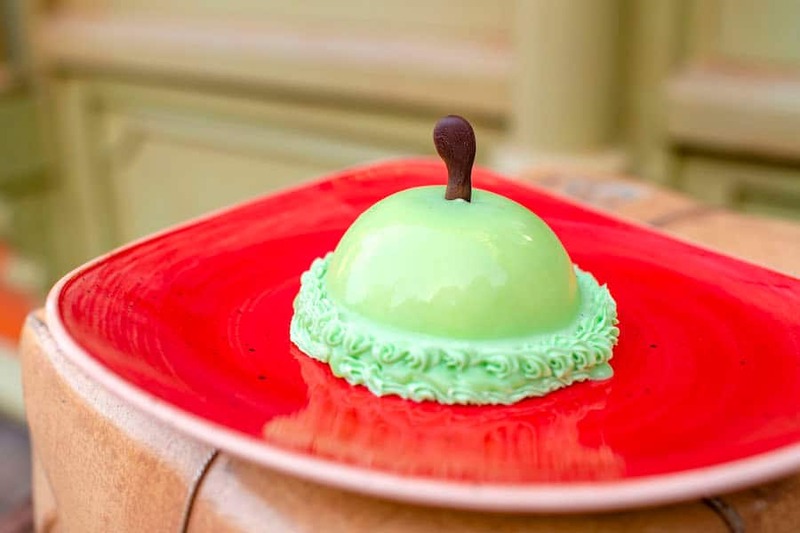 Sweets, sweets, and more sweets are bringing sugary happiness Walt Disney World Resort this month, and I can’t wait to take a bite out of all these treats. Want to get in on the sweetness yourself? If so, I’ve got all the info you need right here with the February edition of Walt Disney World Resort Sweet Treats. First up, we’re trekking to Disney’s Animal Kingdom to try the beautiful Purple Lotus Flower Cupcake. Available at Creature Comforts and Restaurantosaurus, this yellow vanilla cupcake is filled with strawberry mousse and topped with a blooming purple buttercream lotus flower (which goes PERFECTLY with those new purple headbands, don’t you think?). In addition, we’re celebrating Disney’s “The Lion King” with a tasty tribute to a little guy who just can’t WAIT to be king – the Simba Cupcake is a yellow vanilla cupcake filled with yummy white chocolate mousse and topped with buttercream, an edible piece featuring Simba, and a fierce mane of orange and yellow icing. If you’re hunting for this dessert, you’ll find it prowling around Isle of Java and Pizzafari. And at Tusker House Restaurant for breakfast, I’ve heard that the waffles are now themed to Simba and Nala! If you want to see for yourself, you can make a reservation by visiting the Walt Disney World Resort website or calling 407 WDW-DINE (407 939-3463). 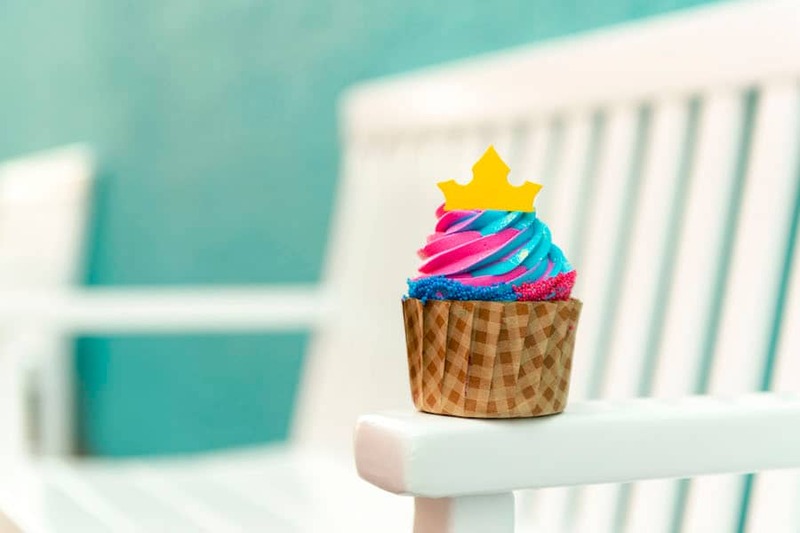 Next up, we’re at Disney’s All-Star Music Resort where you’ll find a certain slumbering princess in the form of a vanilla cupcake with cotton candy buttercream … it’s the Princess Aurora Cupcake! Find it at Intermission Food Court throughout the rest of the month. 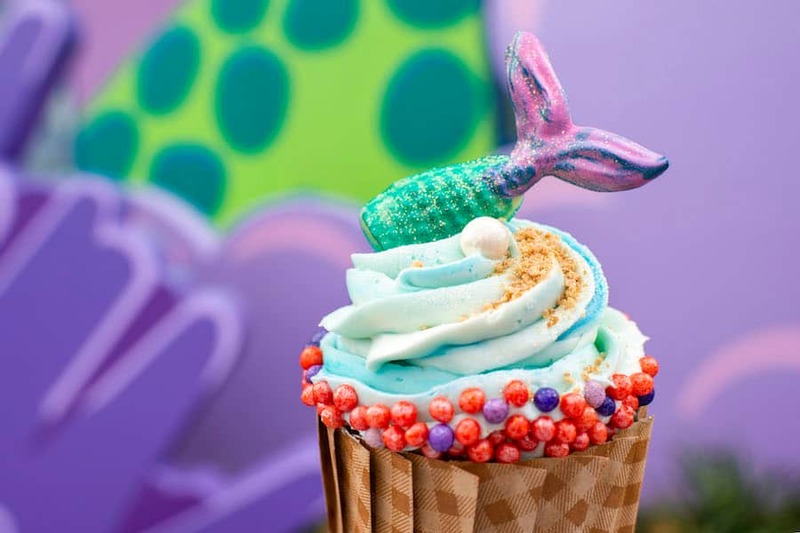 Speaking of princess-inspired cupcakes, splash on over to Landscape of Flavors at Disney’s Art of Animation Resort to try this ADORABLE Mermaid Tail Cupcake. You’ll definitely want this vanilla cupcake to be part of your world, because it’s filled with pineapple compote and topped with coconut buttercream, crispy pearls, graham cracker crumbs, edible glitter, and a white chocolate mermaid tail. I love this next dessert so much, I just can’t let it go! If you’re in the Norway pavilion at Epcot, why not stop by Kringla Bakeri og Kafe to try Sven’s Apple Cheesecake? This apple-shaped cheesecake is filled with apples and isn’t just for reindeer, it’s for people too! 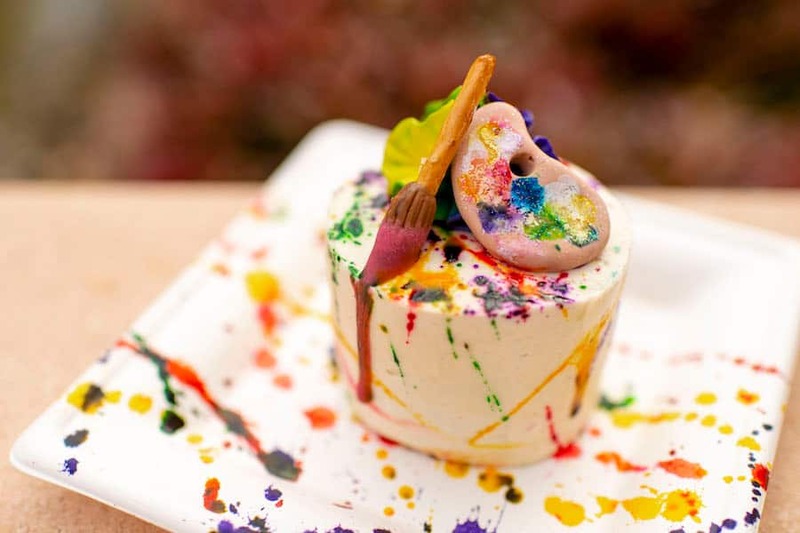 Find your inner-artist with this special Epcot International Festival of the Arts Dessert at Sunshine Seasons. This multicolored vanilla cake is splattered with color and topped with peanut butter buttercream and a little paint brush. It will be available through the end of the festival on Feb. 25th. Last up is a special new offering at Disney Springs. Amorette’s Patisserie known for their incredible dome cakes, often themed after popular Disney characters such as Mickey, Minnie, Pluto, Goofy, and Donald. 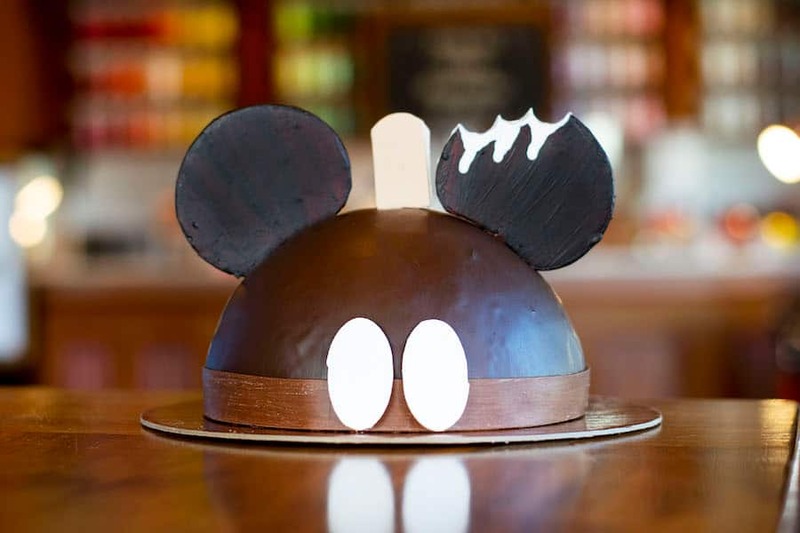 The pastry shop recently added a new dome cake design – the Mickey Premium Bar Dome Cake! Isn’t it the cutest thing you’ve ever seen? With fondant buttons and ears made of chocolate, this dessert is sure to be a hit at any party or special occasion. As for what’s on the inside, that’s up to you. You can place an order by calling 407 934-3500 or by visiting the shop at least 72 hours in advance. For more details on these specialty cakes, visit the Amorette’s Patisserie web page. If these sweets have your taste buds tingling with excitement, then be sure to visit the Walt Disney World resort this month to taste them for yourself! For more information and full menus for all of the locations listed above, visit the Walt Disney World Resort website. Previous articleTangaroa Terrace Reopens at the Disneyland Hotel with Tropical New Eats, Dole Whip and More! Next articleNew Captain Marvel 1/6th scale Captain Marvel Collectible Figure by Hot Toys Coming Soon!